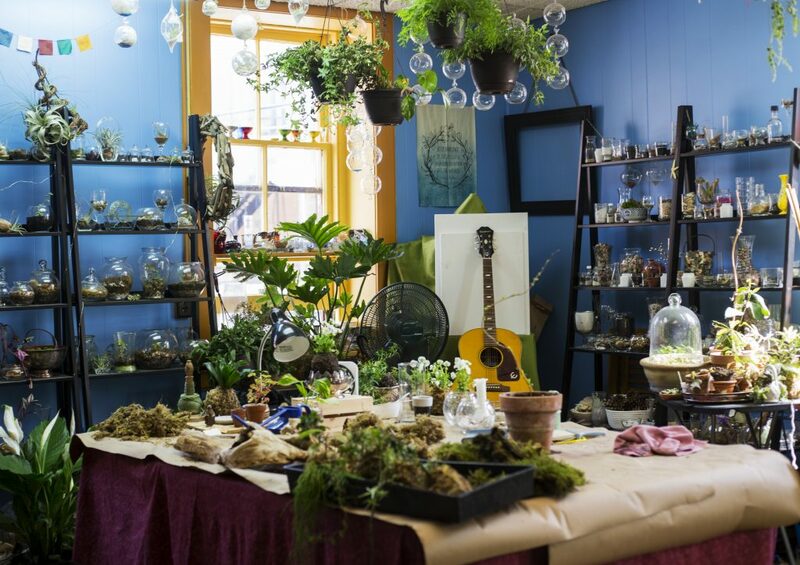 Rebecca Kiss/Assistant Photography Editor Jasmine McAvoy, owner of Kokedama Flora, shows her on-trend terrariums and floral arrangements in her shop on Chenango Street. At Kokedama Flora, shop owner and Binghamton resident Jasmine McAvoy offers on-trend, eco-friendly options in floral design. McAvoy’s business started with weekly trips to a local farmers market, where she sold plants and arrangements. Once she was registered to do business as “Kokedama Flora” this past January, she moved into a shop above Alexander’s Cafe on Chenango Street. Kokedama Flora sells succulents and small plants, flower arrangements, terrariums, wreaths, dish gardens and kokedama — the decorative Japanese moss balls from which the shop got its name. While McAvoy often uses cut flowers, she also creates long-lasting living displays — one terrarium in her shop, for example, has been thriving for a year. In addition to plant sales, the business also offers installations for local events and weddings, and McAvoy teaches plant crafting classes both in her shop and at Broome Community College through the continuing education department. McAvoy’s designs cater to customers who are looking for an earthier, quirkier alternative to traditional floral bouquets and arrangements. She said she aims to give customers access to new design techniques that they might find on Pinterest or in trendy magazines. After graduating from Binghamton High School, McAvoy attended SUNY Purchase to study photography, but found herself interested in the many other artistic disciplines offered there. Her teachers and professors inspired her to dabble in many art forms, and as a result she has explored media, fashion design, photography, printmaking and graphic design. Her first experience with floral art was her job at Lowe’s creating flower displays in its plant department. This led her to a further pursuit of creative jobs surrounding plants, and she got a job at Renaissance Floral Gallery on Main Street upon returning to the city of Binghamton after 13 years of moving around upstate New York, Massachusetts and Georgia. She said that her year working at the florist, and her resulting passion for flowers, introduced her to a new world of competitions, clubs and fascinating historical and cultural significances. While attending a flower show at the Federated Garden Clubs of New York State, she said she learned that many plant enthusiasts and growers are intensely dedicated to the subject. Kokedama Flora’s flowers and plants are grown locally instead of internationally sourced, and local group Volunteers Improving Neighborhood Environments, Inc. (VINES) has given McAvoy the opportunity to grow flowers at its Laurel Avenue community garden. She also grows flowers in friends’ backyards, sourcing other supplies like bark and branches through foraging. According to McAvoy, the use of homegrown flowers and foraged materials connects her to her art in a unique way. McAvoy’s choice to grow local flowers was reportedly inspired by the knowledge that many of the flowers that cross our border are fumigated with insecticides. This awareness has shaped her creative path as a florist. For example, when she was designing an installation for last week’s VINES fundraiser dinner, she originally planned on using eight boxes of mail-order flowers. Instead, she said she decided to use locally sourced kokedama and birch bark for the display. McAvoy explained that she understands this issue more as she learns more about the floral industry, and that ecologically harmful choices are often made because of economic pressures. She has not worried much about economic feasibility yet, but said she hopes to maintain her principles even when things get tough. McAvoy said she also hopes her art encourages people to think about their environment in a different way.